When writing non-trivial shaders (just as when writing any other piece of non-trivial code), people make mistakes. However, I can't just debug it like any other code - you can't just attach gdb or the Visual Studio debugger after all. You can't even do printf debugging, because there's no form of console output. What I usually do is render the data I want to look at as colour, but that is a very rudimentary and amateurish solution. I'm sure people have come up with better solutions. So how can I actually debug a shader? Is there a way to step through a shader? Can I look at the execution of the shader on a specific vertex/primitive/fragment? As far as I know there are no tools that allows you to steps through code in a shader (also, in that case you would have to be able to select just a pixel/vertex you want to "debug", the execution is likely to vary depending on that). .. rest of code .. So you can "observe" debug info this way. I usually do various tricks like lerping or blending between various "colour codes" to test various more complex events or non-binary stuff. In this "framework" I also find useful to have a set of fixed conventions for common cases so that if I don't have to constantly go back and check what colour I associated with what. The important thing is have a good support for hot-reloading of shader code, so you can almost interactively change your tracked data/event and switch easily on/off the debug visualization. If need to debug something that you cannot display on screen easily, you can always do the same and use one frame analyser tool to inspect your results. I've listed a couple of them as answer of this other question. Again, this is very hacky and far from proper debugging, but is what I am stuck with not knowing any proper alternative. There is also GLSL-Debugger. It is a debugger used to be known as "GLSL Devil". The Debugger itself is super handy not only for GLSL code, but for OpenGL itself as well. You have the ability to jump between draw calls and break on Shader switches. It also shows you error messages communicated by OpenGL back to the application itself. There are several offerings by GPU vendors like AMD's CodeXL or NVIDIA's nSight/Linux GFX Debugger which allow stepping through shaders but are tied to the respective vendor's hardware. Let me note that, although they are available under Linux, I always had very little success with using them there. I can't comment on the situation under Windows. The option which I have come to use recently, is to modularize my shader code via #includes and restrict the included code to a common subset of GLSL and C++&glm. When I hit a problem I try to reproduce it on another device to see if the problem is the same which hints at a logic error (instead of a driver problem/undefined behavior). There is also the chance of passing wrong data to the GPU (e.g. by incorrectly bound buffers etc.) which I usually rule out either by output debugging like in cifz answer or by inspecting the data via apitrace. When it is a logic error I try to rebuild the situation from the GPU on CPU by calling the included code on CPU with the same data. Then I can step through it on CPU. Building upon the modularity of the code you can also try to write unittest for it and compare the results between a GPU run and a CPU run. However, you have to be aware that there are corner cases where C++ might behave differently than GLSL, thus giving you false positives in these comparisons. Finally, when you can't reproduce the problem on another device, you can only start to dig down where the difference comes from. 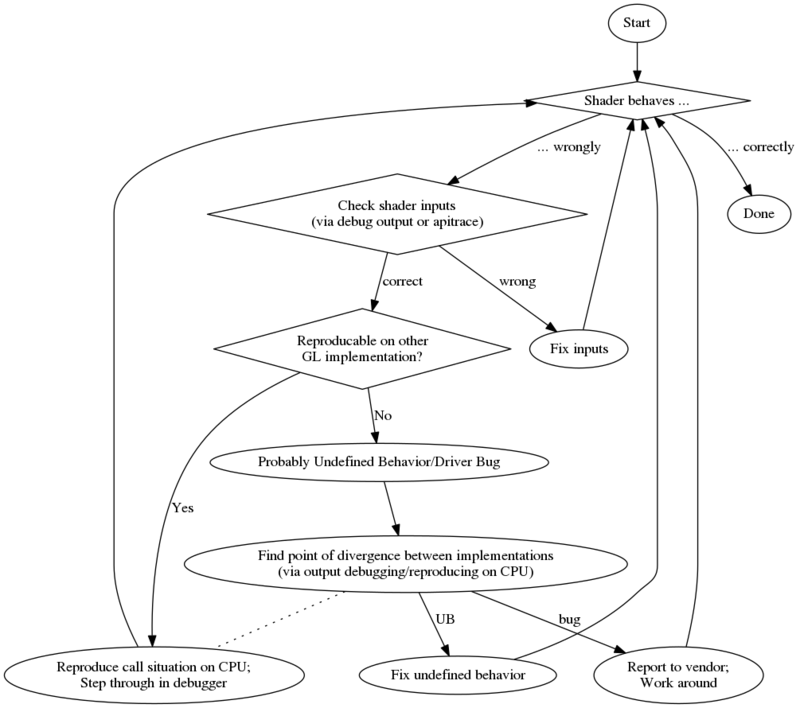 Unittests might help you to narrow down where that happens but in the end you will probably need to write out additional debug information from the shader like in cifz answer. While it doesn't seem to be possible to actually step through an OpenGL shader, it is possible to get the compilation results. The following is taken from the Android Cardboard Sample. If your code compiles properly, then you have little choice but to try out a different way of communicating the program's state to you. You could signal that a part of the code was reached by, for example, changing the color of a vertex or using a different texture. Which is awkward, but seems to be the only way for now. EDIT: For WebGL, I am looking at this project, but I've only just found it... can't vouch for it. This is a copy-paste of my answer to the same question at StackOverflow. After you get this on screen, you can just take any color picker, format the color as HTML (appending 00 to the rgb value if you don't need higher precision, and doing a second pass to get the lower byte if you do), and you get the hexadecimal representation of the float as IEEE 754 binary32. // (off by one) result as compared to the one calculated with infinite precision. // Thus we do it in a brute-force way. // Cut higher bits away. // the resulting subpixel value. // Transform color components to [0,1] range. // the transformation to TrueColor by GPU uses rounding to nearest or upwards. // to TrueColor subpixel value by OpenGL. The solution that worked for me is compilation of shader code to C++ - as mentioned by Nobody. It prooved very efficient when working on a complex code even though it requires a bit of setup. It demonstrates on a Compute Shader from DirectX SDK Samples, how to enable C++ like HLSL debugging and how to setup Unit Tests. Compilation of GLSL compute shader to C++ looks easier than HLSL. Mainly due to syntax constructions in HLSL. I have added a trivial example of executable Unit Test on a GLSL ray tracer Compute Shader which you can also find in the Shaderator project's sources under link above. Not the answer you're looking for? Browse other questions tagged opengl glsl debugging or ask your own question.